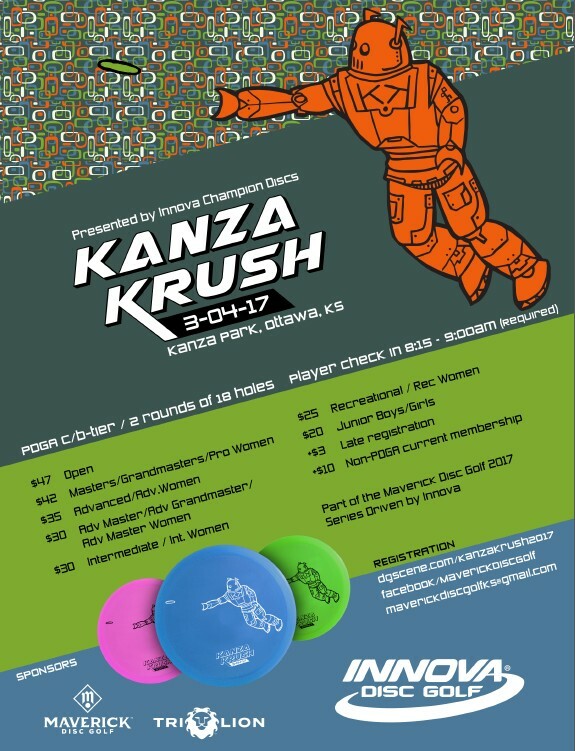 Registration opens up for the Kanza Krush '17 Presented by Innova Discs Wednesday morning, Jan. 4th. We will be using two sets of tees. Long tees will be used for all Pro divisions, All Advanced divisions (except Adv. Master Women if there are enough), and Intermediate men. Short tees will be used for Adv. Master Women, Intermediate Women, all Recreational divisions and all Junior divisions. For those that register early (by Feb. 19), there will be a bonus player pack consisting of an Innova premimum disc, Innova beanie, 2017 disc golf calendar, DewFly towel, sticker sheet and pencil. This is available for all amateurs, and for pros as well (for an extra $20) if you register early. Additionally, if you want to, you can add a long sleeve shirt for an additional $7.50 OR a hoodie for an additional $20. This is also available to pros that opt to purchase a player pack (but not to pros that don't opt to purchase a player pack). The large player pack is only available for paid early registrations. After early registration closes, the player pack will be a premium disc and some other item not yet determined. Finally, because registering after on-line registration closes is so problematic, for all tournaments going forward there will be a $3 additional charge to register after online closes including day of walk ups (if there is room). First, Maverick DG is renting a portable toilet for this event. Kanza Park does not have a toilet on site until Memorial Day, so we are renting one for the day. Second, the tournament is 1/3 full. Reminder - this event does have different tee pads for different divisions. To ensure you get an appropriate tee pad pool, sign up earlier vs. later. Plus, if you sign up before Feb. 19 Ams will get a larger player pack and Pros can choose to get the player pack if they want. For all events in 2017, there will be a $3 late registration fee to register after on-line registrations closes (presuming there are still spots open). 24 spots left. 18 spots for the Long Pad Pool, 6 spots for the Short Pad Pool. The cutoff for Early Registration that will receive the larger player pack has been moved up to Wednesday, Feb. 15. Tournament is full. A wait list has started. There are two wait lists specific to each Pool. Registration for the next tournament, Longview Open, is open. In all cases, the creek running through the course is OB with the exception of hole 6, 8, 10 where you throw across the creek. Then it is casual. There is a mando on holes 14 & 16. They will be marked with a drop zone next to them. In both cases you must be to the left of the mando. If you go to the right, proceed to the drop zone for missing the mando with a one stroke penalty. On hole 14, since the creek left is OB, and the tree right is mando, it does make for a fairly narrow gap. Of course you can go over the OB line as long as you come back inbounds. 1: 264’, Par 3. OB sidewalk right, parking lot left, playground long. Both use regular pad. 2: 214’, Par 3. OB sidewalk right. Both use regular pad. 3: 211’, Par 3. OB sidewalk right. Both use regular pad. 4: Short Pad: Normal pad, 314’, Par 3. Long Pad: NEW THIS YEAR. Behind, on sidewalk. Approximately 335’, Par 3. OB creek right, long, and left. Sidewalk is OB. 5: 620’, Par 4. Tee Pad will be moved up 10’ to level ground. OB creek right, sidewalk left, sidewalk long, playground long. 6: Short: 169’, Par 3. Long: 295’, Par 3. Regular pad is the short pad. Long pad is the sidewalk currently marked with a green line. OB, Sidewalk left, private lawn right and long. 7: 417’, Par 3. OB sidewalk right, creek left. Both use regular pad. 8: Short: 196’, Par 3. Long: 280’, Par 3. Regular pad is the short pad. Long pad is the sidewalk currently marked with a green line. OB Sidewalks. Creek is casual. 9: 322’, Par 3. OB playground right, creek left, sidewalk long. 11: 325’, Par 3. OB Sidewalk right, creek left. Both will use green line painted on sidewalk. It's a safer tee area and only 15' difference. 12: 364’, Par 3. OB Sidewalk right, creek left. Both use regular pad. 13: 339’, Par 3. OB Sidewalk right and long, creek left. Both use regular pad. 14: Short: 379’, Par 3, Long: 989’, Par 5. Long pad is the regular tee area (989'). Short pad is the Drop Zone which is up by the pair of trees (379'). See drop zone rules above. OB sidewalk right, creek left. 15: 236’, Par 3. OB sidewalk left, creek right. 17: Short: 318’, Par 3. Long: 630’, Par 4. Long pad is the regular tee area. Short pad is on the bicycle / walking path to the right of the fairway. It was marked with green paint. This is the sidewalk towards the industrial buidings, not the walking path that winds through the park. OB sidewalk right and left. 18: 257’, Par 3. Both will tee off sidewalk immediately to the left of the normal tee area - marked with green paint. It is a safer tee area. OB sidewalk right and long. On concrete under bench. Wow, what a windy day. Monday morning and my face still feels weather worn. Nova wrote a blurb on her public page about the event. Here is part of it. The wind was HOWLING, 20-25 MPH steady with gusts to over 30 and even 40 by the end of the second round. Putts from outside the circle were simply out of the question, and any disc which showed its underside to the wind would promptly blow away, often traveling further to the side than it had forward. After the first round, there was a three-way tie for the lead among myself, Cynthia Ricciotti, and Kim Giannola. In the second round the wind was blowing even harder than the first round. Still, I used what I had learned about the wind and went for some longer putts at the fringes of the circle, sometimes with success, and in any case always making the come-backer if I did not. I think I tried this about 9-10 times, and converted 3-4, which happened to be the margin of victory. Every exposed part of my body is parched from being in the grip of gale-force and bone-dry winds all day long. My hands, face, and even my legs from ankles to knees are dry like tissue paper.